I don’t throw the word ‘easy’ around willy nilly. 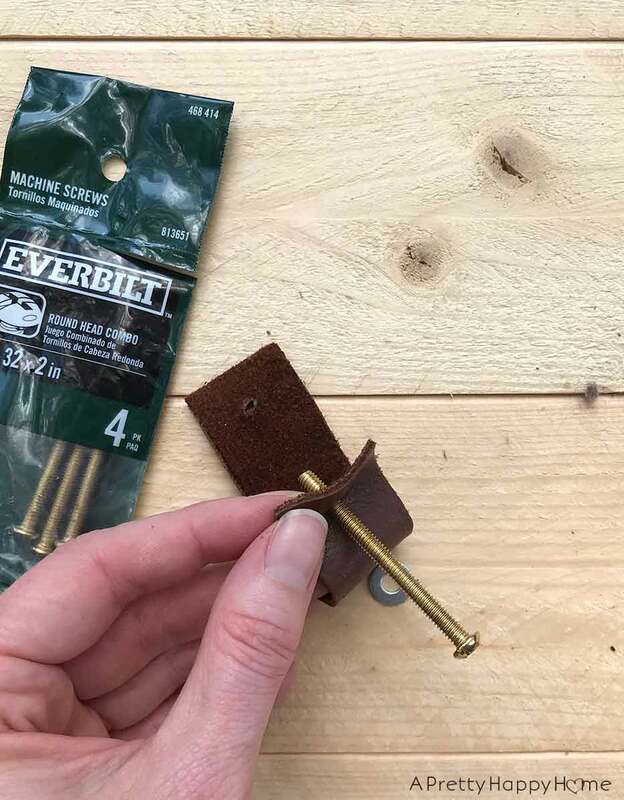 So if I say it is easy to DIY your own leather drawer pulls without fancy tools, then trust me, it is. I’m of absolute certainty that there are more proper ways to make leather drawer pulls, but I’m all about using the tools I have on hand. Call it a creative problem-solving challenge. 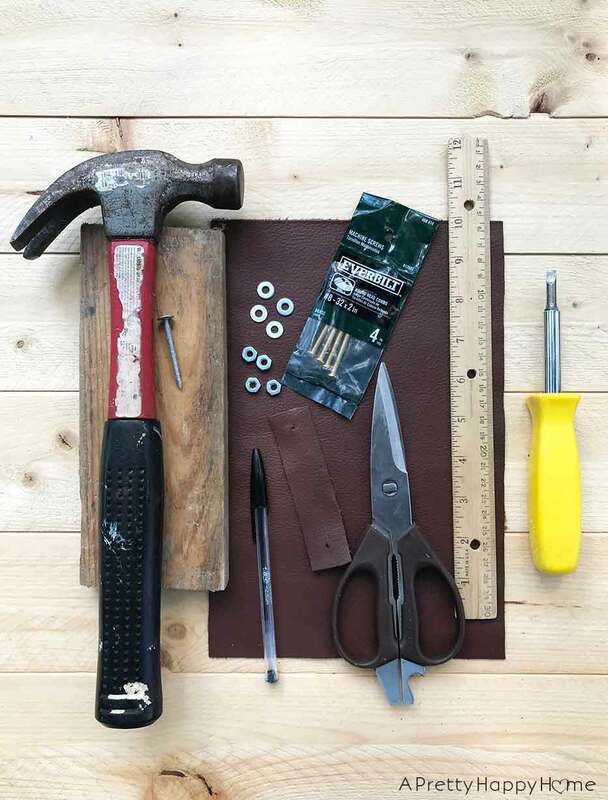 If I was going to go into the leather pull business, then I’d invest in leather tools, but for a one-time project, this is how I made it work. And it was actually easy! I purchased a sheet of leather from Michael’s. With my coupon it was $6.59. 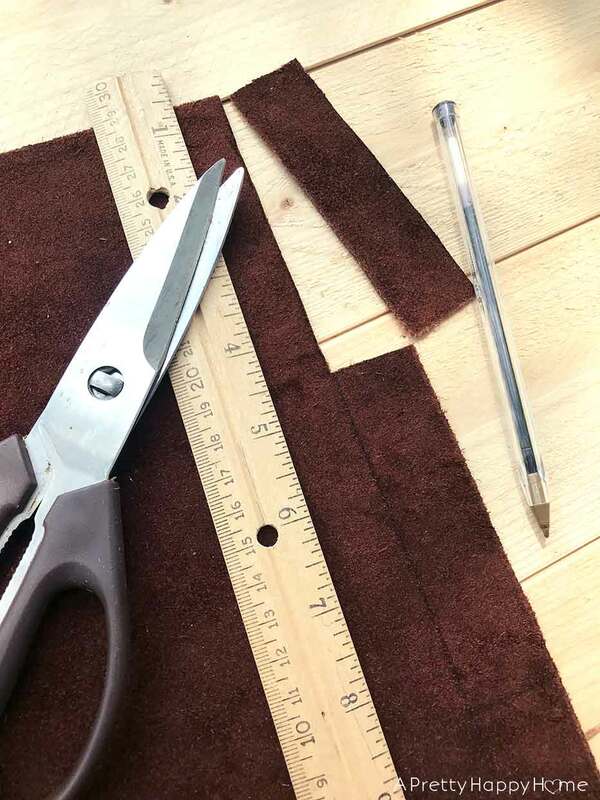 On the back side of the leather (the side that isn’t going to show), I used a pen and ruler to measure the length and width of my pulls. For my particular project, I determined I would need a 1-inch x 4-inch strip. I carefully cut the strip out with scissors, but a craft knife would probably have created more precise cuts. I did have to trim a few strands. The next step is to create the hole where your drawer pull hardware (screw, washer and nut) will go. 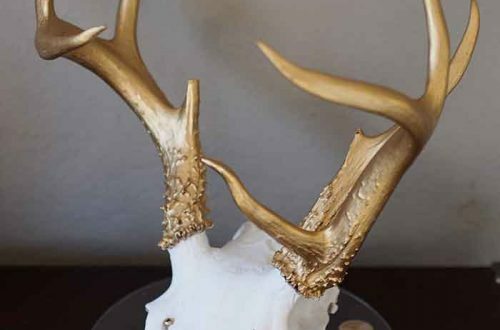 You’re going to need a scrap piece of wood, a hammer and a large nail for this part. When I say “large nail” I mean any nail that will make a hole the approximate size of your drawer hardware (in other words, the screw). Fold the leather strip in half and place it on your scrap wood. Triple check that it is lined up exactly how you want it. Then determine where you want the hole for your hardware to go (mine was centered a 1/2-inch down from the top) and then hammer away. You’re not trying to nail all the way into the scrap board. Just enough to create a hole in the leather. At this point, it will be helpful to use the nail or even your pen cap (see the first picture) to make that hole as wide as possible. 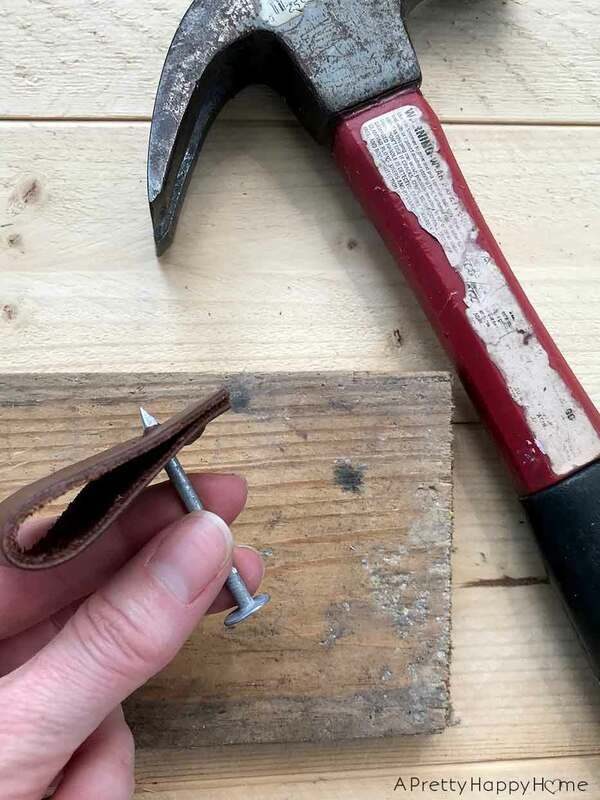 Just wiggle the nail around to stretch the hole out. 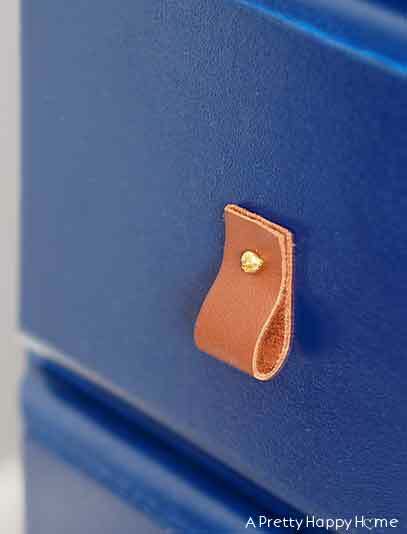 Once the two holes in the leather are big enough, it is time to insert the drawer hardware – the screw. Keeping in mind which side of the pull you want to face out, you’re going to work your screw into the holes. The screw threads are going to provide resistance in sliding the screw through the holes, that’s why you want to make the hole as wide as possible first. If your hole is too small, inserting the screw will require a little elbow grease and then you’ll be mad at me for calling this project easy. Let’s pause for a moment to talk about the “hardware” for this project. I used a screw (the prettiest one I could find at Home Depot – true story), a washer and a nut. The size of screw you select for this project is going to depend on the drawer you are installing them in. 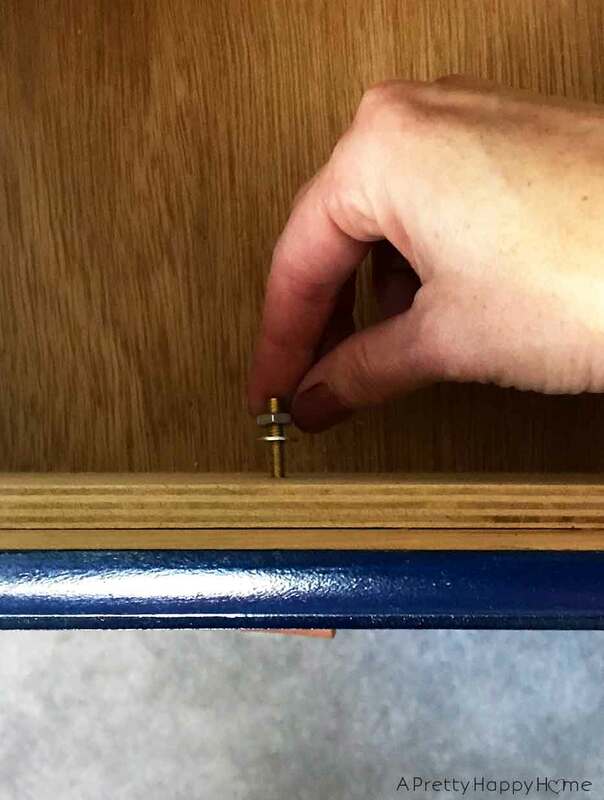 I needed screws that would fit the width of the pre-drilled drawer pull holes plus the depth of my drawer fronts. I recommend taking whatever hardware you are replacing to your home improvement store and making sure you buy a screw that is the same width. In regard to the screw length, remember to take into account that adding a washer and nut will add to the length you need. 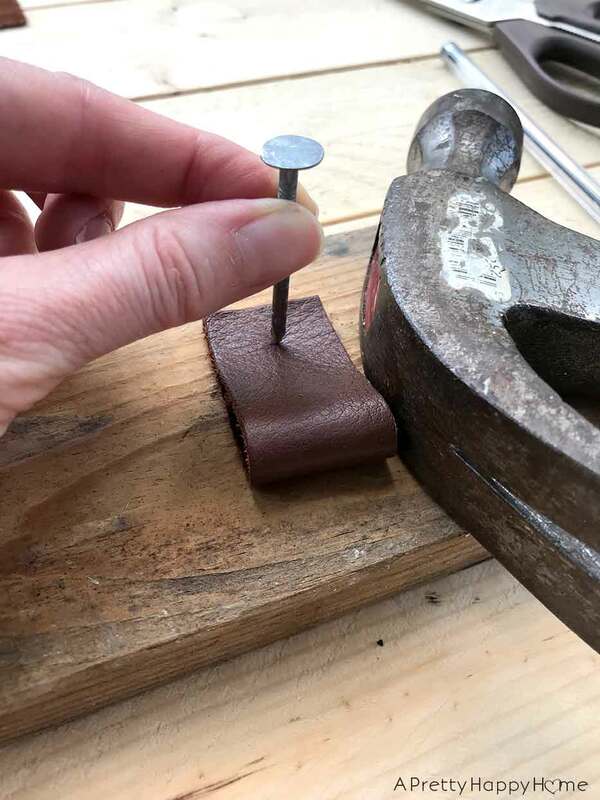 Once the screw is inserted into your leather pull, the last thing to do is to insert it into the drawer and secure it with the washer and the nut. The washer goes on first (it will be the part touching the back of the drawer) and the nut will tighten against the washer. If you are having a hard time getting the nut super tight, you may need to hold a screwdriver in the screw head to keep the screw from moving while you tighten the nut. 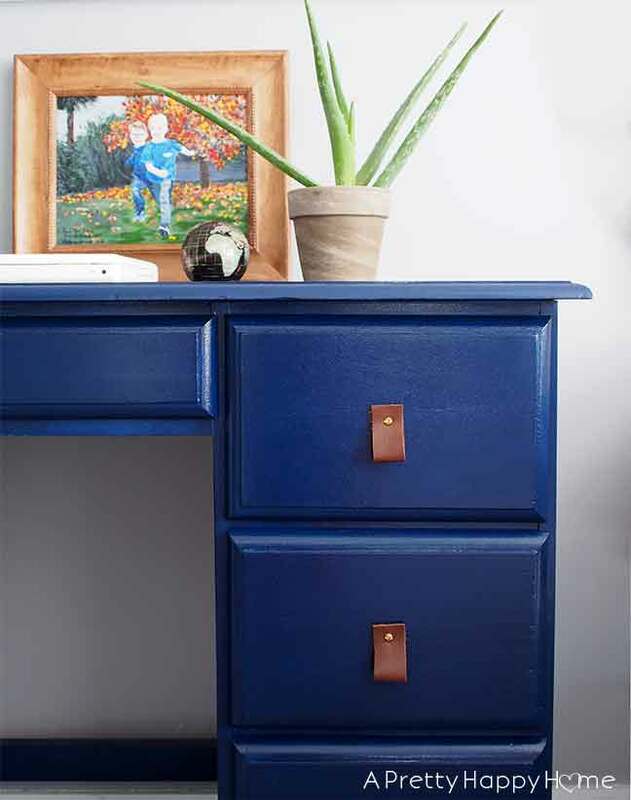 You just DIY’d your own leather drawer pulls! I’ve had these leather drawer pulls done for about a month and they’ve held up beautifully. I will say I created these drawer pulls for a desk that doesn’t see a lot of daily usage, so I will have to update you on how the pulls hold up. I’m assuming if you are using these leather drawer pulls in a high-use area that you might need to use thicker leather. But so far, I haven’t seen any movement in or ripping of the leather. 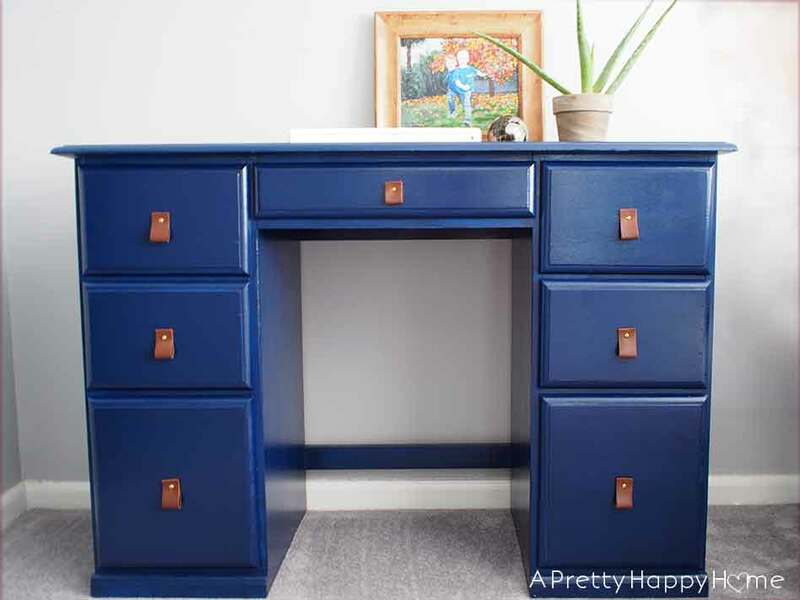 I needed seven drawer pulls for this desk. Using the products I linked below, it cost me $2.02 plus tax per leather pull. Plus, I have leftover leather, nuts and washers to use for another project. All in all, I’m super happy with how the leather drawer pulls turned out. But the real fun was in figuring out how to make the project work without using complicated tools. Sometimes my ideas don’t work out the way I envisioned, so when one does I’m pretty thrilled! Desk is a thrift store find. Painting is custom by my aunt. Aloe vera plant is from the grocery store. Apple laptop is “vintage” circa 2007 that my kids type on. Globe paperweight is old, but here’s a similar one. I like it! You are so clever. However I expected that you were using the old boot leather that you used for so many projects. Maybe you ran out of it or the leather wasn’t strong enough for this project or the right color. I said that because you are so good at using what you have. It wasn’t thick enough! And…I sort of used it on another project I’ll share, hopefully next week.